'Game of Thrones' actress Maisie Williams reveals a huge heartbreaking moment from the show's finale. Right now staying on the web might be a terrible idea for Game of Thrones fan. After HBO announced 14th April as the premiere date for GoT's final season, the internet has been putting out leaks and spoilers (though joker in the pack) either to let loose the ever-growing overwrought or just to kill the joy in every ardent follower of the epic fantasy-drama show. While keeping up with the agenda of “not giving the plot,” there’s always the erratic and youngest one that goes on to become a loose end. And GoT is no exception either. 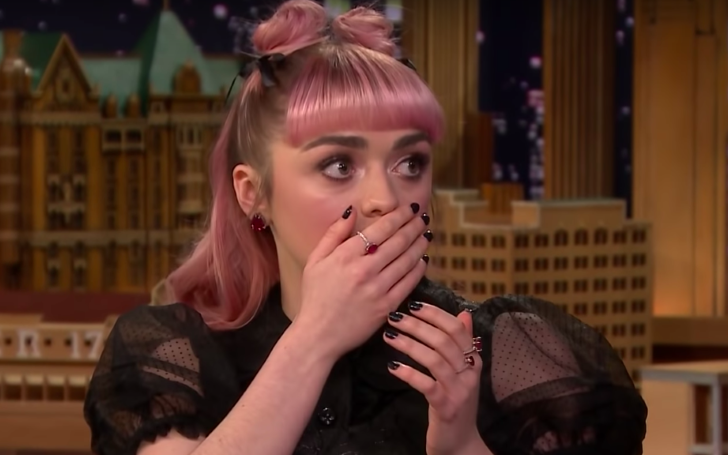 As such actress, Maisie Williams has accidentally dropped a major spoiler from the super-secretive plot of GOT, while responding to Fallon’s request. Maisie Recently Appeared on Jimmy Fallon Show. Williams who plays Arya Stark on hit HBO series Game of Thrones was recently on 'The Tonight Show Starring Jimmy Fallon' where she was insisted by the host to share her top five iconic moments from the show. The 21-year-old then narrates her excursion with the Hound in season 3 and how it was a defining moment for her and the fans. "And then she was with the Hound for a long time and there was a line maybe season 3 where she was like, 'One day, I'm gonna stick a knife through your eye and out from the back of your skull.' That was like a pretty defining moment when you realize how messed up in the head she had become." The British star also included the season 7 finale as one of her grand spectacles as she said, "In last season (7), she reunited with Sansa again and so that was a pretty big moment. And they both united and killed Littlefinger." Don't Miss: Who sits on the Iron Throne? Game Of Thrones’ Season Eight Premiere Already ‘Leaked Online’? "That's iconic. That's not bad," responds Fallon, insisting her to spill more from the much-awaited finale. "During shooting like the final day, it's really like emotional saying goodbye to all the cast, because when I found out that Arya died in the second episode..."
"Are you kidding me, that's a spoiler!" Fallon shockingly responds to which Maisie asks him to edit that out before nervously storming off the screen. Fallon's auditorium is then submerged in an extended silence with everyone in the room unsure as to whether she was joking or not. It was, of course, a bootleg spoiler, as was revealed after Maisie ran off stage, only to reappear shouting 'APRIL FOOLS' with Fallon, after which both burst into laughter claiming to have 'got you guys so bad'. The act of teasing one of the biggest possible plot points was too daring of Maisie Williams which has now left the fans in the worst pit of permutation game. Among all the other cases, the death of Arya is the last thing viewers would want to see in Game of Thrones; should such a scene ever happens then they really will have got us.